Hello! and welcome to a new article series I hope you will enjoy called The Fun Factor. But before I tell you what this series is about, let me first tell you a little about myself which will segway into what the future of The Fun Factor holds for us. My name is Aaron and I been a paper Magic since the release of Ice Age. I originally started buying magic cards because of the artwork. I have a passion for fantasy art and the pictures had me hooked. I had no intentions of playing the game. I actually thought that card games could never hold an intellectual value for me. Then one day a good friend of mine sat me down (to my objection of course), and game me a simple black deck, and showed me how to play. From that point forward I was very intrigued. As my interest grew into the gave so did my skills. I would enter countless tournaments......only to never win any of them. That's right. I probably played well over a thousand tournaments and never won. Highest I ever placed was 4th. (I did win a multi player event once but that wasn't sanctioned so it really doesn't count). So you are probably saying to yourself right now, "Self !, how can a guy who has been playing all this time and never won a tournament possibly write and article I would be interested in that could help me play competitive?" The answer to that is...I can't , which brings me to what the Future Sight (I just had to do it) of The Fun Factor will hold. If you look around the Internet in search of decks and articles, a majority of what you will find is articles and decks on tournament scene. What I see lacking is what we all play magic for, the fun of it. I want to write articles that will keep the fun alive. I don't want to boor you with lots of statistics, how to draft, what the metagame is, how to hose a Flash deck (if that's even possible). I want to have fun writing my articles, I want you as the reader to have fun reading them, and most of all I want you to take that fun with you, and spread it to other players. In addition The Fun Factor will hold articles about decks that you may never see in a tournament scene. These decks unworthy of going toe to toe with Dragon storm, Dredge, Boros Wins and the like. Decks that are based around theme. Decks that may never win a game but are truly fun to watch be played, and your opponents will like you playing them. I will even write about decks that are...um...are...Uhh....shhhhh, don't tell any one...but they will be over.....60 cards. WHAT?!?! you say!! That's right, I will be building some decks for you that are over 60 cards. Other articles may focus on what playing a fun deck is all about. Strategies, tech, different types of tournaments and events, and Magic etiquette. Occasional I will throw in some paper reference as well since I know there are paper players, but the primary focus of the articles will be MTGO. Now before I go any further I want to stress a point that can never be stressed enough, and that's defining "fun" in magic. There is an old adage that was preached to me when I was training to be a manager for a restaurant. I had to remember this when dealing with irate customers. The saying goes like this (sing along if you know the words) "You can please some of the people all the time. You can please all the people some of the time. But you can't please all the people all the time." Basically, not everyone is going to agree with you that you are playing a fun deck. The primary goal is something like this. One, is it fun for you? Secondary, is it fun for anyone else? And don't think that if you are playing a deck that you consider fun, and its beating the socks off your opponent, that you opponent doesn't think its fun. He may be so in twined about this rogue deck of fun you call it that he flatters you buy building the same deck for himself. When I myself am beat by what I would consider a fun deck, and interesting deck, a one of a kind, I feel the need to make it one of two and build the deck myself. I admire someone willing to "think outside the bun" (if any Taco Bell Execs are reading this, you can send me a PM for my mailing address so that you may send me a check for that plug in ) and building a deck that someone came up with is just an acknowledgment that "hey, you built such a cool deck, I made it for myself". And I am sure Heath will appreciate it when you direct them to MTGOtraders.com for the cards they need. (PM me Heath, and I will give you a mailing address as well for that plug in). So how does the deck work? The object here is to power out a Vulturous Zombie and a Mesmeric Orb as quickly as possible. The orb will fuel the zombies power at the same time making your opponents resources diminish. Your opponent will be placed on a time clock forced to choose to tap his creatures and lands to deal with threats, or to conserve his deck in hopes he will draw a good card before he is plant food. 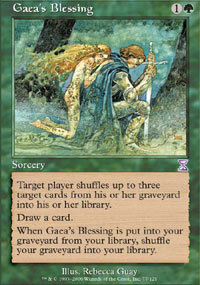 The Gaea's Blessing will help to Replenish your deck and draw cards. Elves of Deep Shadow and Llanowar Elves not only work for some early damage, but also provide mana acceleration to put the zombie in play by turn three. 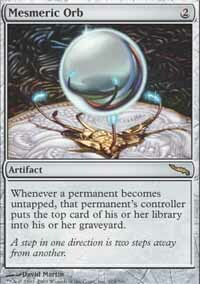 Diabolic Tutor will fetch any card you don't have and Kodama's Reach insures the proper colors you need. Naturalize is suited to take care of an pesky enchantments or artifacts that may be holding you back from defeat. Privileged Position will hold off an disruption that would eliminate your combo pieces. Grim Harvest and Vampiric Link are recovery cards. The harvest will bring back a zombie from the graveyard and the link helps to provide a means of getting back lost life. How did the deck fair in play? I played twelve games. Of the twelve I only lost one to Affinity. that deck is way too fast for this deck. I was dead in three turns. about five of the players didn't even finish the game out. They just conceded. My toughest match up was a white weenie deck. My opponent managed to keep my combo pieces off the board while I had to fight against a barrage of tokens. When I finally stabilized, he had about fifteen tokens on the board and my zombie as a 12/12 creature with a Vampiric Link. My opponent held off attacking, but finally did so dropping me to seven. I swung with the 12/12 hoping for a miracle, not realizing he had only 10 cards left in his library. That attack brought me back to nineteen life. Once he hit his un tap phase, the rest of the deck went to the grave yard. When state based effects were checked during his draw step, the game ended because he had no cards to draw. If he would of at least had one card, I would of been dead. So the deck has two kill mechanisms. Mill the deck or get beat down. Some weaknesses I see are artifact, enchantment, and creature removal. If you find your combo pieces being destroyed, work on getting the Privileged Position out as soon as possible. Luckily for me the only person that removed any of my combo pieces, did so with a Vindicate. Other then that no one ever touched my other pieces. Lets also keep in mind my practicing was all done in the Anything goes room. I didn't expect to do good against tournament decks, but maybe I will give it a try and see how it does. If I had the cards to do so, some obvious changes to the deck would be two Damnations in place of a Rend Flesh and a Privileged Position. Also there would be four Overgrown Tomb. Since my funds are lacking and I am trying to save for a wedding (I stress the word Trying), I can't afford these cards. Well that about wraps it up. Leave me some feedback, pointers on the deck or article writing. This is after all my Second ever article, first for Puremtgo. So go easy on me...I am...sniff....Sensitive. Not offended. not everyone is going to like my articles. Its all good. Hope you like the enxt one. seriously guys, who cares about a few spelling errors? cool article! no offense, but i've seen you misspell literally almost hundreds of words in your articles. you always judge everyone's articles as if yours are some kind of masterpiece. give the guy a break, would you? i thought his article was cool. I don't think you should cut anybody slack for spelling errors these days. We've come a long way from looking up words in the dictionary. He really didn't have any major blunders though. A quick paste into Word only revealed on a few the highlighted the importance of proofreading outside of Word. Ehy, i repeat, the deck is nice and it's "a bit" original, and i like your article, but IMHO it is simply a control deck without any fun (except for you that win :) ). Hope you won't be offended, and really hope to read other articles by you! Good start Lythand! 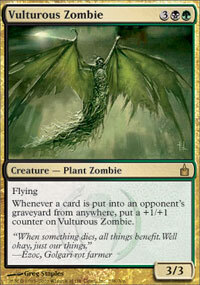 I love fun decks and in fact I have one G/B Zombie deck which also uses Vulturous Zombie as the main attraction. Also, I played against Orb+Blessing combo several times and I know that it really hurts unless you somehow manage to get rid of the orb. Overall a nice start :). The content is good. The writing itself leaves a lot to be desired. No offense, but the number of rudimentary spelling and grammar errors is just mind-bogglingly awful. Should'nt of been any spelling errors. I did a spelling check multiple times. As far as the Grammer, well I did read it over and thought I caught all the issues, but I guess I missed a few. Not a bad start, although the grammar does need attention. I really like the idea behind the theme as its not something that gets a lot of coverage. Would like to see a bit more in the way of playtesting. Overall, its a decent start and looking forward to the next one. Imp. I appreciate it, and I will probably be doing that. Thanks. Conceptually, a solid debut article. If you want help or advice with proofreading, let me know.